On the drive to Cape Breton, you’ll pass through just one sizable town between New Glasgow and the Canso Causeway — Antigonish. It’s a college town, that’s home to St. Francis Xavier University, and it has a nice downtown that’s worth walking around. That’s what I did. Antigonish is located just north of Trans Canada Highway 104. It’s about 213 kilometers from Halifax. I spent a little while walking around downtown Antigonish. 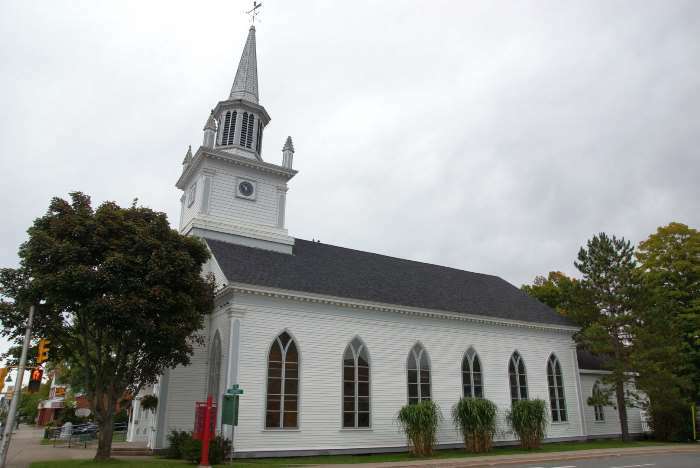 As is common with most small towns in the northeast, there’s a church with a steeple. This one appears to have a clock, too, but it wasn’t long before I realized that time was standing still. It looks as if the clock’s hands are painted-on, permanently displaying a time of 10:30. Hey, at least it’s right twice a day. Antigonish’s town hall displays a more accurate clock. 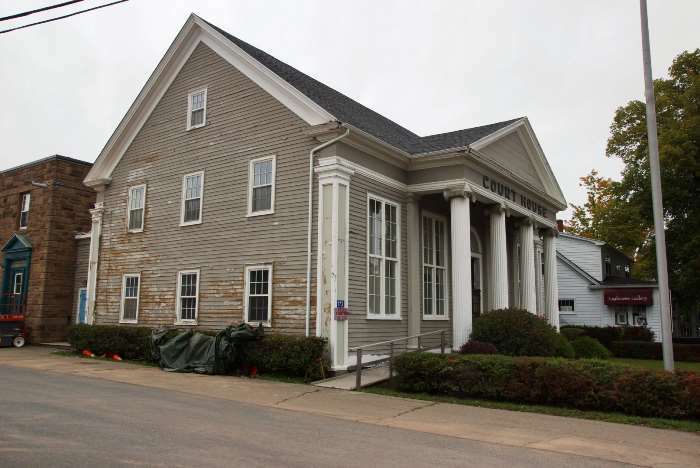 You’ll find this beautiful brick building at the corner of College and Main Streets. 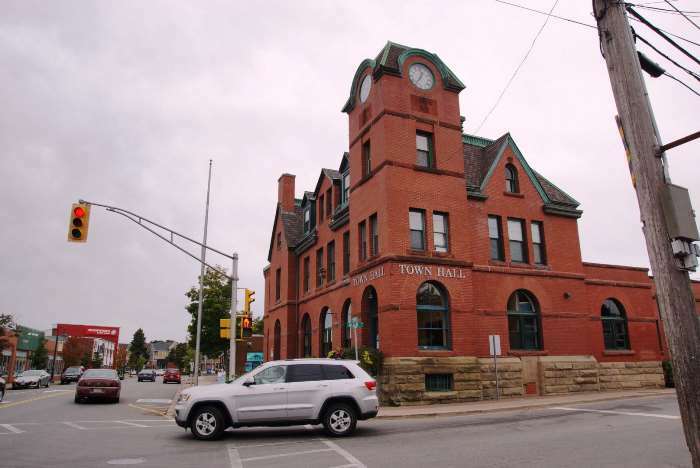 The town hall is not the same as the courthouse. That building is just down the road — although I can’t explain why the front of the building appears to be one story tall, but the side looks like two stories. 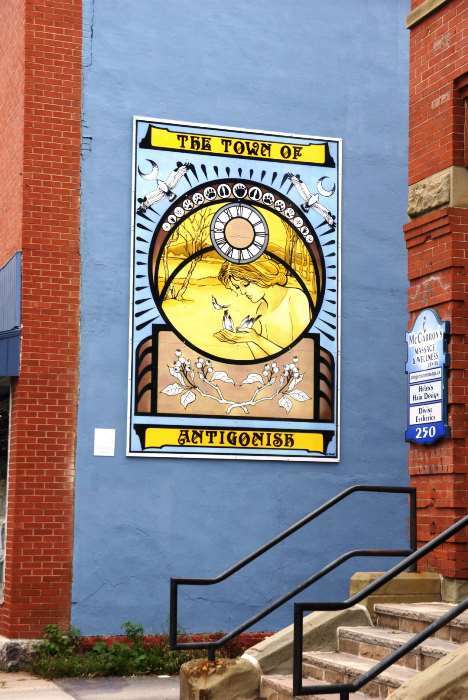 So what’s with the name Antigonish, you may ask? It’s a Mi’kmaq word, which either means the place where the branches are torn off by bears gathering beechnuts or meeting place of five forked rivers. I heard it pronounced while I was there, and the best way I can describe it is to put the emphasis on every syllable: AN-TI-GON-ISH. Off of Highway 104 near Antigonish, you may be tempted by a restaurant called Mother Webb’s. It’s the kind of place that makes you think it’s world famous, whether it is or not, because of all the distinctive road signs. I didn’t stop for a steak, but the online reviews look pretty good, and it is a local landmark, so it may be worth checking out. Antigonish is a small town that’s worth a brief stop, if you’re in the mood to get out of the car and look around.